Your Jiankou to Mutianyu tour will start today. Get to Dongzhimen Station by metro line 2 or 13. Use Exit H to reach Dongzhimen Transit Hub. Take bus no. 916 there and get off at Huairou Beidajie stop. Then charter a car to go directly to the Wofo Villa. Hike uphill from the villa for 2 hours to the foot of the Great Wall. Climb up to the ramparts by a wooden ladder and you will find yourself at the inflection point of a stretch of V-shaped wall. That is the Jiankou Spot, the lowest point of Jiankou Great Wall. After a short rest, go along the ramparts to the east and you will arrive at the Tiny Potala Palace via two watchtowers. This tower was so named because of the similar appearance to the Potala Palace in Lhasa. Looking eastwards, you will see a watchtower on a higher peak. It is your next destination, Zhengbei Tower. You will arrive there after another one hour's Jiankou to Mutianyu hike. Zhengbei Tower occupies the highest location of the whole Jiankou Great Wall. 'Zhengbei' means due north in Chinese. The tower got this named because it is located right to the north of the axis of Beijing City. From there, you can have a full view of the whole section and take perfect shots of the Tiny Potala Palace. Continue this Jiankou to Mutianyu Great Wall hike eastwards to the Ox Horn Edge. Ramparts take a 90-degree turn there according to the mountain ranges and looks like an ox horn at a distance, and hence the name. You are advised to take a shortcut through the woods at the first watchtower to make a detour. You will get back to the ramparts in less than 10 minutes. After another 10 minutes' hiking, you will arrive at the western end of the well-preserved Mutianyu Great Wall which reveals a totally different view from the wildness of Jiankou Great Wall. Get to the No. 14 Watchtower before 17:00 to catch the last cableway downhill. Alternatively, you may follow a track near No. 14 Watchtower to the foot of the mountain. This independent Jiankou to Mutianyu Great Wall walk tour will come to an end here. After getting out of Mutianyu Scenic Area, please take a taxi to Huairou Bus Station and then change to bus no. 916 there back to downtown Beijing. 1. It may require around 6 hours for average backpackers to complete the whole hiking route. 2. If interested, you may set up a tent at Zhengbei Tower to spend one night on the Great Wall and enjoy the stunning sunrise the next morning. 3. After hundreds of years of wind and rain, stairs of the Ox Horn Edge have already collapsed into gravels. Without obvious trace of steps, the whole section is like a giant downward slope. Please hold the wall and don't step on rubbles to prevent slips and falls. 4. There are wooden ladders provided by locals at Jiankou Spot and Zhengbei Tower to help backpackers to climb up. You need to pay CNY 5 for using them. Is it really possible to do this hike (Jiankou to Mutianyu) in one day including getting there and back to Beijing? Or should you have an overnight in one of the places? It is takes around 5-6 hours to hike from Jiankou to Mutianyu, but it is impossible for you to go back to Beijing downtown the same day if you take public transport. I recommend you go to Jiankou in the early morning and stay one night at a hotel near Mutianyu. However, I highly suggest you book a guided tour with a travel agency as Jiankou is quite wild and steep and it is dangerous for you to hike by yourself. Hello my question is about a hike from Mutianyu Great Wall to the Jiankou Great Wall. We want to go to Mutianyu Great Wall and go up with the cable car and then turn left towards Jiankou. 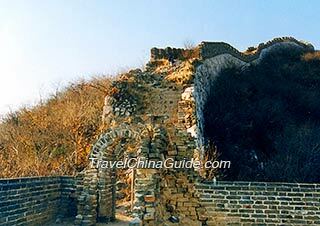 My question is: Can we just walk past the last watchtower of the Mutianyu section and walk a bit over the unrestored wall of the Jiankou section? Is it not mandatory to have a guide here with us? It is ok for you to climb Mutianyu by yourself, but I think it is hard to do this in Jiankou. You should hire a guide to help you, when road signs are not clear in Jiankou. Hello Clara thank you for the answer. 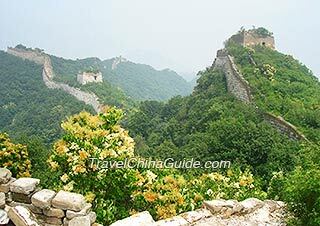 I want to know if it not illegal to go from Mutianyu great wall to Jiankou great wall without a tour guide. And I have one more question. When we go back from Mutianyu to our hotel near the airport we want to take a taxi instead of a bus. Are those available at the gate of Mutianyu? Not illegal. I am sorry that I am not sure if you can get a taxi at the gate of Mutianyu.